There are many recreational activities available in Crestline/ Lake Gregory. For those who like to swim, boat or fish, Crestline's Lake Gregory Regional Park in the San Bernardino Mountains is a favorite destination. Click on the Lake Gregory button at left to find out more about these activities. Completely surrounded by the San Bernardino National Forest, there are hundreds of miles of hiking and mountain biking trails in the Crestline area. 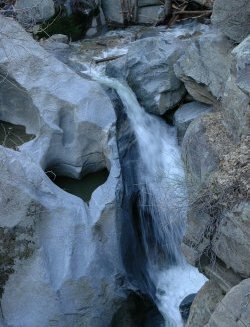 The record-setting precipitation of the 2005 winter has transformed the mountain forests and rocky high desert country near Crestline, making our mountains a great hiking destination. Click on the links below for information and photographs of two excellent hiking and walking spots in our area. Heart Rock in Crestline (shown at left). The Lake Gregory Fitness Trail. The Crestline area also boasts one of the top paragliding ports in the nation, with spectacular views of mountains, cities, the ocean and the desert. Paragliding lessons, rentals and rides are offered in Crestline. We will soon be posting information about the Crestline Chamber of Commerce-sponsored paragliding tournament, which will be held this summer. Lake Gregory is also an excellent destination for birdwatchers. Just at the lake, bird enthusiasts may find great blue herons, green herons, terns, white pelicans, red-tailed hawks, sharp shinned hawks, golden eagles, Stellers Jays, scrub jays, California thrashers, woodpeckers, mountain bluebirds, dark-eyed juncos, nuthatches, northern flickers, hummingbirds, ospreys, cormorants, gulls, mallards, buffleheads, ruddy ducks, canvasbacks, cinnamon teals and more.